Her father Khirat al-Shater, second in command of the Muslim Brotherhood, has just been sentenced by a military tribunal to seven years in jail for belonging to a banned organisation and giving funds to the brotherhood. He was among 25 leading members given sentences of up to 10 years. Khirat suffers from high blood pressure and diabetes, his daughter told me, and he has been refused treatment. "He is not allowed to go to any hospital, and when the prison allowed him for once to go to the hospital the security officers stopped the doctor from examining him." She fears he will not live out his sentence. The Egyptian government did not comment on the allegation. But another political activist Ayman Noor - who like Zahraa's father suffers from diabetes - has been refused treatment. His wife, Gameela Ismail told the BBC earlier this year that months after doctors had recommended urgent surgery to save the sight in one eye her husband was still awaiting treatment. Zahraa, a 32-year-old mother of four, also learned on 15 April that her husband Ayman Abd al-Ghani was given a three-year sentence by the same tribunal. This was after a civilian court had acquitted the two of all charges, saying there was no case against them. But in a country where hundreds of Muslim Brothers were arrested in advance of municipal elections earlier this month and where there has been a wave of strikes, protests and unrest, Zahraa believes the case was politically-motivated from the beginning. "The civilian court acquitted them and they were released but the police re-arrested them moments after the verdict. "The civilian courts didn't give [President] Hosni Mubarak the verdict he wanted, so he handed them to the military court to get the verdict he wanted," Zahraa says. She also says that when the wives and family members arrived at Haikstip military base on the outskirts of Cairo to hear the sentencing they - as well as the defendants' lawyers - were denied access to the tribunal. Some of the women were beaten, she told me. 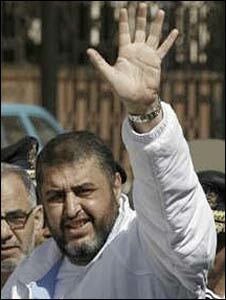 The Egyptian government has long considered the Muslim Brotherhood a violent and dangerous organisation. 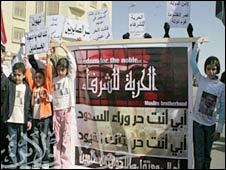 The Brotherhood has been officially banned since a 1954 assassination attempt on then President Nasser. For several years, though, the Brotherhood has insisted it advocates only peaceful change. Zahraa rejects the attempt to portray the organisation as a terrorist group: "This is false. What terrorism action did the Muslim Brothers do? "They [officials] have no evidence for what they are saying. They want to crush any organised political opposition because the Muslim Brotherhood is the greatest political opposition against the government." But Zahraa says it is difficult for the families. "We can't explain to our children why the women are being beaten in the streets and why the government is taking the fathers who are the good models in their lives. "It is very hard to explain to them that being patient is not being passive. We try to tell them that we must be peaceful people. But - seeing what is happening to us - I feel we are living in a forest and we have no right to defend ourselves." The families can appeal the verdict of the military tribunal within two months of sentencing. But when asked if she has any hope her husband and father will be released Zahraa simply says "No."